Large apartment with 3 separate rooms. Disabled access. Very nice apartment, very spacious (100 m2), comfortable, well equipped with three independent rooms really. The entire apartment is designed to accommodate people with reduced mobility. It is located on the ground floor of a house Grandfather, south-west, in the village of Métabief, easy access and parking. It is near the ski slopes about 800 meters. The free shuttle bus stops in front of it for easy movement to the slopes without taking the car (during the school holidays). This apartment offers great benefits carefully decorated and character in mountain style. The spacious rooms allow you to be comfortable during your stay even when you are 8 people. 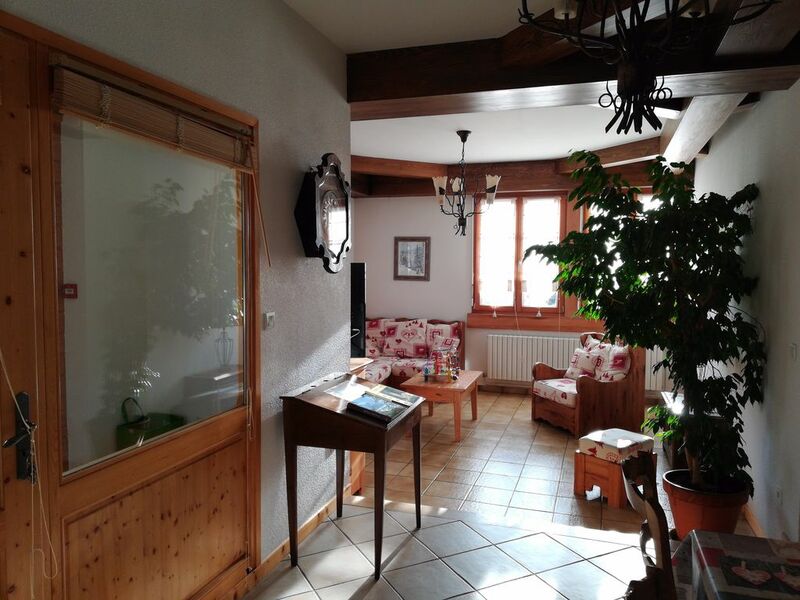 It consists of an entrance hall which can be stored in the ski equipment and bikes. The integrated modern kitchen is very well equipped with sink, multifunction oven, ceramic hob, microwave, dishwasher, fridge, freezer. It is open on the dining area equipped with a television and large table with extensions. The large living room separated from the dining area by a step consists of a convertible corner sofa, armchair, ottoman, coffee table, LED flat screen TV, DVD player, stereo, board games, books. two bedrooms with two beds of 90 X 200 and tv led each. The bedding is quality brand Treca equipped with duvets. All rooms have a wardrobe or wardrobe, very convenient for storage. The bathroom tiled and tiled is composed of a sink, an Italian shower, a bath and a heated towel rail, a wall-mounted hair dryer with international plug. A cellar is also at your disposal with all the necessary cleaning (Miele vacuum cleaner, washing machine and dryer brand BOSCH, dryer, scrub brush ....). The apartment is fully tiled and parquet (one bedroom) for impeccable hygiene. Everything is done to offer you a pleasant stay: in addition to the comfort of the apartment, it is very well equipped with crockery, pans and small household (raclette, fondue, pierrade, pancake party, and a nespresso machine, kettle, filter coffee maker, mixer, electric whisk, culinary scale, vegetable mill ....). Toys for children are also available. Feel free also to baby equipment (high chair, cot). CENTRAL HEATING to have warm and lit before your arrival, double glazed windows. No extra charge for heating, water and electricity. Logement idéal pour se retrouver en famille! Nous avons passé une semaine très agréable dans l’appartement. C’est propre, spacieux et confortable. La navette pour aller jusqu’aux pistes de ski s’arrete juste devant et il y a un grand parking. Merci pour votre avis et au plaisir de vous accueillir à nouveau. fût très chaleureux et d'une grande disponibilité pendant tout le séjour. Très bien chauffé . Cuisine bien équipée et fonctionnelle. Sanitaires de belles dimensions. Très grande chambre parentale et deux autres plus petites mais très agréables. Un bel espace de vie pour les soirées familiales. Le tout au coeur même du village et non loin des pistes. La neige ayant tout recouvert de son manteau blanc ce fut un très beau Noël! le parking est très appréciable. A recommander. Tres beau gîte très spacieux et impeccable. Un seul bémol : le temps plus automnal apres 3 semaines de beau temps chaud mais c'est ça le Haut Doubs qu'on aime! Nous avons passés une superbe semaine dans cette location.Rien n'a dire.Nous avions tous ce qu'il fallait dans cette appartement..et surtout une chaleur comme on le souhaitait avec ces témpérature négatif.On n'y retournera sans hésitation.Et encore un grand merci à la maman de la propriétaire qui était toujours la à notre écoute. PRIX ADAPTE POUR DEUX PERSONNES ET PRIX WEEK-END EN BASSE SAISON ET ETE. Caution d'un montant de 600.00 euros et Caution ménage de 70.00 euros demandées à l'arrivée. La totalité du paiement de la location se fait à l'arrivée du séjour par chèques bancaires, de vacances ou espèces. CAPACITE D'ACCUEIL MAXIMUM 8 PERSONNES.